Here is our full Monitoring, Evaluation and Learning (MEL) Report on the Brighter Futures programme and the impact of the programme in its first 18 months. Thanks go to our volunteer, Alyssa Koenig, who wrote the majority of this report using information collected by our implementation partners, NCEDP. Brighter Futures is a current community outreach project run by the Ndhiwa Community Empowerment and Development Project (NCEDP) and fully funded by partners Team Kenya UK, which aims to use football as a tool for engaging girls and boys in gender equality conversations to help reduce Gender Based Violence (GBV) and School Related Gender Based Violence (SRGBV) in hopes to empower girls and transform communities. The project was first implemented at the beginning of 2017 and is currently running in the Ndhiwa Community in Homa Bay County in Kenya. Throughout the community, girls and women have been bearing the disproportionate burden of poverty as a result of their gender. Gender Based Violence (GBV) and School Related Gender Based Violence (SRGBV) are both issues that Team Kenya and NCEDP have personally witnessed and have identified as directly affecting the lives of young women in rural Kenya and their opportunities for a brighter future. Brighter Futures aims to directly address these issues and assist in reducing GBV and SRGBV by providing a range of activities for girls and boys to engage in during mixed gender group encounters. The use of football as a tool for mixed gender interactions allows participants to link sport skills with greater understandings of teamwork, fair play, confidence-building, leadership and respect for themselves and for others. The program is heavily focused on reducing violence against girls in particular but aims to reach all pupils, for such change requires the commitment of the community as a whole. This report has been written for the purpose of Monitoring, Evaluating and Learning (MEL) from Brighter Futures’ impact from January 2017 to date in the Ndhiwa Community. Surveys, interviews and various evaluation tools have been collected by NCEDP and Team Kenya and used as indicators to measure Brighter Futures’ project objectives. The result of this report yields positive feedback from teachers, leaders, parents and other pupils in the community who have been directly impacted by Brighter Futures. Multiple requests for more events and recommendations to expand throughout more areas and schools were also reported. Additionally, attendance, grades, behavior, and mixed gender interactions have increased throughout all 8 partner primary schools. In response to the findings listed in this report, Team Kenya and NCEDP have already begun implementing additional ways for Brighter Futures to improve on its impact in the community and maximize its greatest strengths. Together, the organizations remain dedicated to Brighter Futures’ ability to continue bringing awareness to the community and the potential it holds to assist in transforming the lives of girls and women in rural Kenya. The following data was collected on behalf of NCEDP from February 2017 to February 2018 based on the MEL Plan designed for evaluation, monitoring and learning purposes. The dataset analyzed consists of information collected across six schools in and around Ndhiwa and is based on the feedback and performance of students, teachers, mentors and the community. The corpus includes a variety of interviews, surveys, feedback forms, reports and records. The data collected is evaluated in line with three project objectives set by NCEDP and Team Kenya for Brighter Futures. The objectives are identified and used in this analysis to measure the effectiveness and impact Brighter Futures has had in the Ndhiwa community in 2017. Project objectives and indicators used for measurement are identified and described as follows. 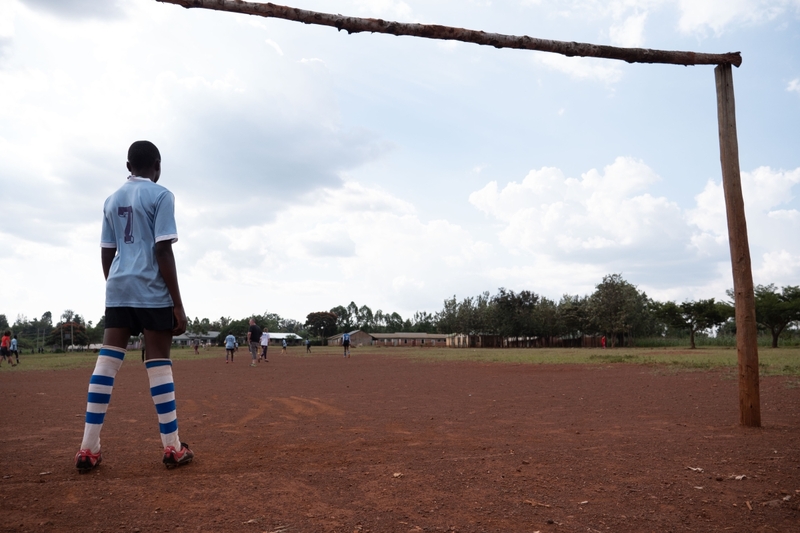 Project Objective 1 aims to raise the profile of girls’ rights issues throughout communities in and around Ndhiwa by implementing a mixed gender football skills program in local primary schools. Project Objective 2 aims to use football as a means of reaching the wider community to challenge attitudes and make long-term changes in the ways girls and women are treated. Project Objective 3 aims to provide support and guidance for girls who are vulnerable to and/or are victims of gender-based violence. From the school interviews, it was found that overall, Brighter Futures 2017 has had a positive effect on the student performances and behaviors across the participating schools in the community. As SRGBV rates continue to decrease and mixed gender interactions increase, it can be determined that the program is successfully carrying out its objective to raise the importance of girls’ rights in schools and the community. Event feedback forms were distributed and collected from Brighter Future participants following all events for the purpose of gathering feedback and measuring Brighter Futures Project Objective 2. The following results are based on samples collected from four primary schools — Bongu Primary, Arina Primary, Nyarath Primary, and Ndhiwa Primary. These results are included as an example. 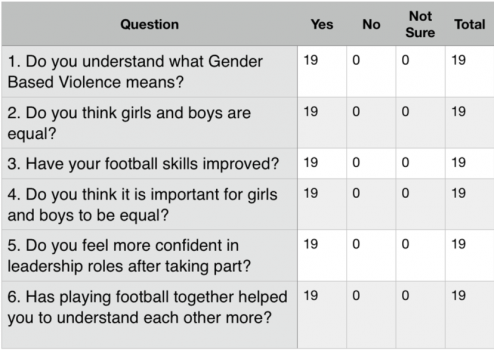 The event feedback forms found that positive results for all questions, though some students did not feel that their football skills had improved significantly. It is thought that this is due to some of the classroom aspects of the session overrunning, which led to a reduced amount of time remaining to play football. This issue will be addressed by ensuring that each session plan is followed adequately. Outreach sessions are held with different groups within the community, including teachers, parents, boda-boda riders, taxi drivers, cane cutters and auctioneers. Sessions are also held with all community members invited. Questionnaires are distributed to community members at the beginning and at the end of an outreach session. For example, questionnaires used at an outreach session with community members at Nyarath Primary in January 2018 found that all attendees thought the event was important for the community and 80% felt differently about girls’ rights after the event. Brighter Futures’ tournaments are also held to motivate students and reach a wider audience. At the end of each tournament a questionnaire is distributed to attendees. The following results are from students who attended a tournament in December 2017. The tournament questionnaires have consistently demonstrated positive results throughout the 18 months of the Brighter Futures programme. To enable Objective 2 to be achieved on a greater scale, we are planning to follow the advice from several questionnaires to expand our programme. The Brighter Futures programme is now being expanded from 8 schools to 12. Through the Brighter Futures football programme, particularly vulnerable girls are identified and offered guidance, counselling and other forms additional support. Home visits are made to these girls as part of this additional support. Whilst it would be inappropriate to provide personal details for any of the girls involved, we are pleased to report that we have found that girls receiving additional support generally experience improved academic performance and, if they are victims of any form of abuse, this is generally reduced as a result of the intervention. Girls’ Support Groups are established at each partner school to provide education to girls on important issues, such as gender equality, school-related gender-based violence and how to deal with problems. We were delighted that all members of the Girls’ Support Group who graduated in 2017 achieved sufficient grades to enrol in secondary education. The Girls Empowerment Star helps monitor girls’ perceptions of the opportunities and empowerment in their lives. It involves focus group discussions with girls and we have used it to measure the attitudes girls in our Girls’ Support Groups have towards their lives. The Girls Empowerment Star was last conducted with girls in August 2017 and the results were as follows. Shortly, we will be conducting an updated Girls Empowerment Star study and hope to find improved results relating to last year, though overcoming many of the issues will be a long term process. Household work – Do girls and boys share household work equally, including childcare? School – Do girls complete at least nine years of school? Speaking up – Do girls say what matters to them in front of an adult male? Money – Do girls help decide what to spend money on? Marriage – Do girls decide when they marry? Pregnancy – Do girls decide if they get pregnant? Safety – Do girls feel safe in this community? Feeling valued – Do girls’ concerns matter in this community? The answers to each question are outlined below. 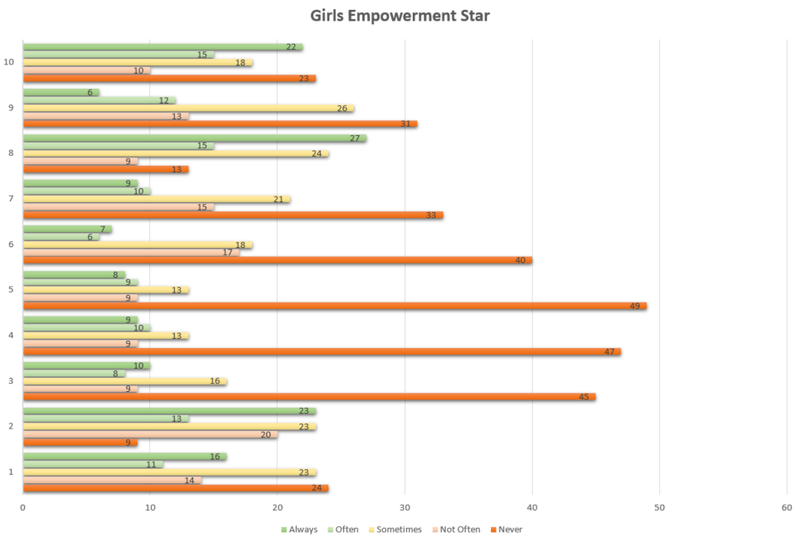 Typically the Girls Empowerment Star is demonstrated with a star, but so that all data can be shown on one chart a different format has been used. If the bars are predominantly green, this suggests that the girls in our Girls’ Support Groups have a positive perception towards this area of their lives. If the bars are predominantly orange, this suggests that the girls in our Girls’ Support Groups have a negative perception towards this area of their lives. In addition to primary data collected by NCEDP and Team Kenya for the purpose of monitoring, evaluation and learning. We regularly monitor public records from local government authorities to assess the impact our work contributes towards in the wider community. Since 2016, the number of sexual offences recorded in Ndhiwa has reduced by 53% which reinforces the evidence of our impact. However, we are reluctant to read too heavily into these figures as sexual offences are so often not reported.